You can put these display cases against a wall and display whatever you need. These wall display cases will make keepsakes shine. 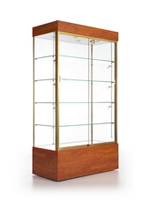 This wall display cabinet is ideal to use as a trophy display or for any of your merchandising needs. Wheels make this rectangular trophy cabinet very easy to relocate. This unit is shipped pre-assembled for your convenience. Available in two different widths. 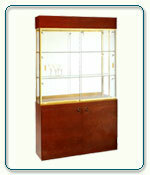 This is an exceptional series, rectangular, wall display case. It measures - 48W x 13.5D x 80H. Top lights keep items illuminated well and easy to view. The two 50 watt halogen lights ensure that the products on display receive the maximum light available and are easily visible. This rectangular display case is also constructed out of solid wood making it extremely stable and durable. This wooden wall display cabinet is made out of high quality solid wood materials. This gives this display cabinet the durability to survive in a retail environment. This tall wooden glass display tower is constructed of solid wood materials. This makes this display tower extremely durable and stable. This tower cabinet will have no issue holding up in a high traffic environment. This tower display case is a great addition to any retail space. The vertical construction saves space. The dust resistant design keeps your items clean. This display case will blend well with any décor due to its simple design. 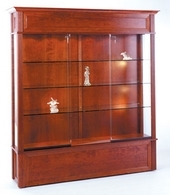 This traditional wall display case is shown in cherry, solid wood veneer. It measures 75"w x 17 1/2"d x 82"h. Top lights keep items illuminated well and easy to view.